Last week Digital Doughnut joined hundreds of marketers attending the Festival of Marketing at Tobacco Dock in East London, to hear 160 hours of presentations and panel discussions spread over two days. Below we have covered three key festival takeaways for those who weren’t able to attend the event, or caught only a small fraction of the presentations delivered by more than 200 speakers covering 18 marketing-related topics. AI is already having an impact on all manner of industries, with some of the world’s leading thinkers applying their minds to the opportunities and potential perils surrounding the evolution of this technology. Interviewed by Centaur Marketing president Ashley Friedlein at the start of the Festival, the actor, comedian and technophile Stephen Fry described AI as the “great tsunami that is facing all of us”, with the power to shape the society of the future. “We are going to have to prepare for a world where people are free to do whatever they want … if AI has a purpose it’s to do the dull things,” he added. Picking up on this theme was IBM’s Jeremy Waite, the company’s evangelist for its AI-based Watson Marketing solutions which help companies harness cognitive learning for customer analytics, marketing automation and real-time personalisation. in his talk entitled ‘Marketers v Machines: Building Empathy into AI’, Jeremy described Watson as an “intelligent assistant” and a “smart best friend” that can do in one second what it takes someone a lifetime to do. “Ninety percent of the data in the world was created in the last 12 months and most of that is unstructured,” he said. He gave a demonstration of Watson’s capabilities, which will increasingly enable marketers to refine their campaigns using voice technology to speed up the process, among other things. Another speaker with AI running through his veins was Phrasee CEO and self-described “digital anarchist” Parry Malm, the UK Tech Entrepreneur of the Year, whose company focuses on using machine learning to create better email subject lines and calls to action. Ashley Friedlein was back to unveil the Modern Marketing Model (M3). 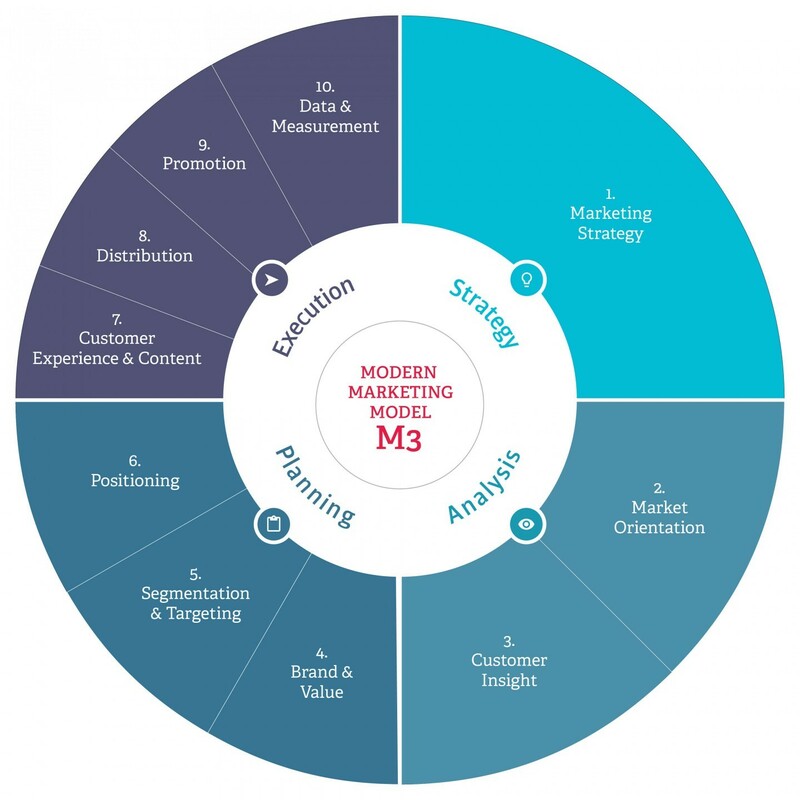 The Econsultancy founder has developed M3 in an attempt to fuse the worlds of digital marketing and traditional marketing to ensure that companies have “clarity and focus”, rather than being held back by organisational silos. He blames the lack of clarity around the role and purpose of marketing for the frighteningly short tenure of chief marketing officers who survive in their jobs for less time than any of their C-suite counterparts, according to research by recruiters Korn Ferry. The new Econsultancy / Marketing Week model, which covers strategy, analysis, planning and execution, is a useful reference point for marketers who want to make sure their thinking is up-to-date and holistic. CMOs should very much be in the vanguard of a brand’s attempts to drive digital transformation within their businesses. Their role in the context of the digital imperative is covered in a free-to-download Digital Doughnut report published earlier this year, entitled How to Build a Digital Business and How to Thrive Inside One. There are now reportedly more than 17,000 Skills available to users of Amazon’s Alexa Voice Service. For the uninitiated, Skills are essentially programs which can be enabled via the Alexa app to help you do a range of things including listening to the radio, hearing the news or ordering a pizza. The scramble by brands to create Skills has been compared to the early days of the App Store when companies raced to get their iPhone apps launched with mixed success. Many of these apps fell by the wayside, while some gained traction and added real value to brand equity. Paddy Power’s product innovation manager, Stephen McMeel, spoke about the betting company’s Alexa-related tech development, describing how they trialled a daily 10-second gambling briefing, a 90-second news bulletin, a gambling results feed and a podcast. Among Paddy Power learnings was the need to provide people with genuine utility, using the popularity of Alexa timers, commonly used in cooking, as an example. Describing how it is much easier to speak to Alexa rather than washing your hands and setting a timer on your phone while handling chicken, he said that they and brands need to find their own “raw chicken moments”.